During this difficult time of loss, let them know they are remembered by you. This elegant gourmet gift basket is filled with Satsuma Mandarin Oranges, Romanello® Cheese, Urban Oven® Olive Oil Crackers, Filled Chocolates and more. They’ll appreciate knowing they’re in your thoughts. During this difficult time of loss, let them know they are remembered by you. 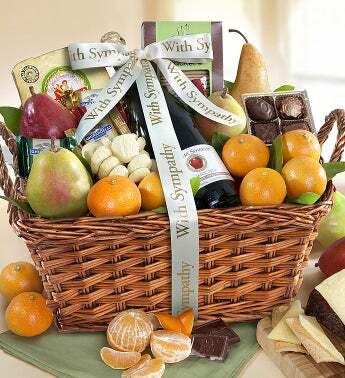 This elegant gourmet gift basket is filled with Satsuma Mandarin Oranges, Romanello® Cheese, Urban Oven® Olive Oil Crackers, Filled Chocolates and more. They'll appreciate knowing they’re in your thoughts.